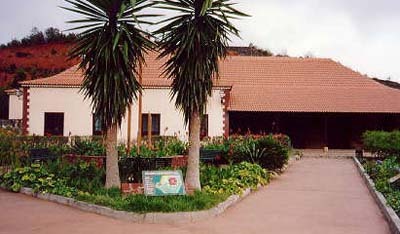 The Juego de Bolas Visitor’s Centre is located in La Palmita, on the north of La Gomera in the municipality of Agulo. In this place you might find much official information, brochures, hiking trails and others about the Garajonay National Park, proclaimed by UNESCO as World Heritage for being the best laurel forest in Europe. In this Visitor’s Centre you might also find many precious gardens that are a great example of the native flora, an ethnographic museum with many exhibition rooms where you can find many objects and information on the local culture and nature of the island. In its interior you might also see a big model of the island where you can check its uneven orography as well as take a look at informational panels about the fauna, flora, geography and culture of La Gomera. Monday to Friday from 9.30am till 4:30pm..